OVERCOMING DAILY OBSTACLES THAT THEY FACE DUE TO THEIR CONVICTIONS. 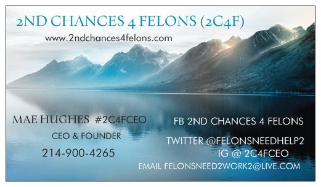 I would like to welcome you to the 2nd Chances 4 Felons website. Your success is our main goal. We are dedicated to each and every one of our clients and will go the extra mile to provide you with information needed to succeed despite your conviction(s). The reason for this website is for informational purposes only and not to be considered legal advice. If you are dealing with a serious legal matter, Do not act on information obtained from this website without consulting with legal counsel. Correspondence of any kind to the staff of 2nd Chances 4 Felons does not constitute any form of an attorney/client relationship. 2nd Chances 4 Felons is providing the service of community support and advocacy for those impacted by the criminal system.